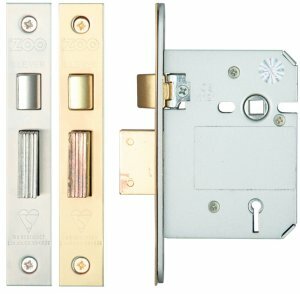 Zoo British Standard BS3621 5 lever sash lock, BS kitemarked with laminated deadbolt. Locks are keyed alike so the same key can be used for front and back doors or any number of locks. Available in 64mm and 76mm case sizes with PVD brass or stainless steel forend and strikeplates, supplied with 2 brass keys per lock.